Is there anything better than a perfect donut? No, no there is not. I usually find a way to fit a donut shop stop on our travels, and it turns out, other travel bloggers do, too. I asked my friends to share the best they’ve encountered on the adventures, and let me tell you, these all sound amazing! Who’s up for a Midwest Donut Tour? 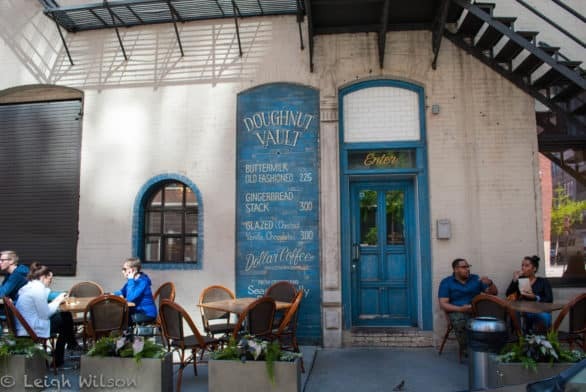 The Vault only serves a few flavors a day: Buttermilk old-fashioned, glazed options and a couple of daily flavors that are announced on Twitter each morning. They also only make a limited amount, so keep an eye on Twitter see when they are sold out and closing for the day. On weekends, the Vault opens at 9:30 a.m., but people start lining up way before then. What would normally be a short-lived trend has sustained for several years now! There is no seating indoors, just a narrow indoor space to queue up for delicious donuts. 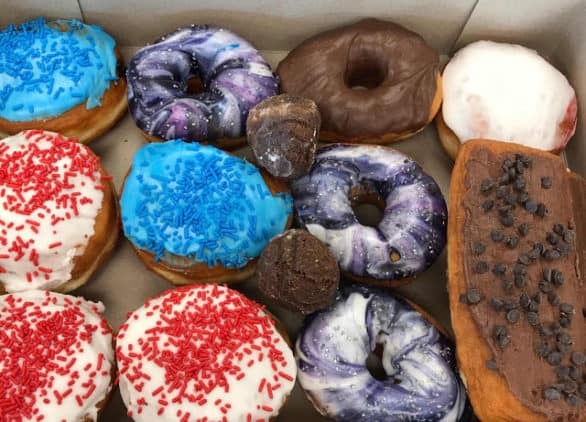 Leigh at Campfires & Consierges recommends going with a few friends so you can sample all of the available flavors – she has yet to meet a Doughnut Vault donut that I didn’t like! For more information, visit doughnutvault.com. So hidden you might walk past it a few times before finding it, the Off Site Bar in Chicago’s Logan Square neighborhood sits next to a small back patio behind the Longman & Eagle bar/restaurant/inn. OSB operates as a stand-alone micro bar in the evenings, but as a donut shop pop-up on Saturdays and Sundays. OSB offers a changing weekly selection of donuts, featuring classics with inspired, modern twists. Our recent favorites have included beet cake with chocolate glaze, peanut butter cream with curry coconut glaze, and chocolate chip with caramel pepper glaze. Vegans be warned: These donuts are fried in beef fat. If you have no moral objection to that, you will be thrilled by the amazing difference it makes! Beside the donuts , what else is there to love at OSB? Dark Matter Coffee and Rare Tea Cellar teas, both based in Chicago, are served. And OSB/L&E even offer overnight rooms for rent to travelers. Meaning you can snooze in a urban chic room after a few drinks at night while waiting for phenomenal donuts in the morning. By far, it’s a favorite donut set-up in the city! For more information about Off Site Bar, visit longmanandeagle.com. If you want more Chicago donuts ? Check out Open Wide The World’s post on 9 Donuts Not To Miss In Chicago. 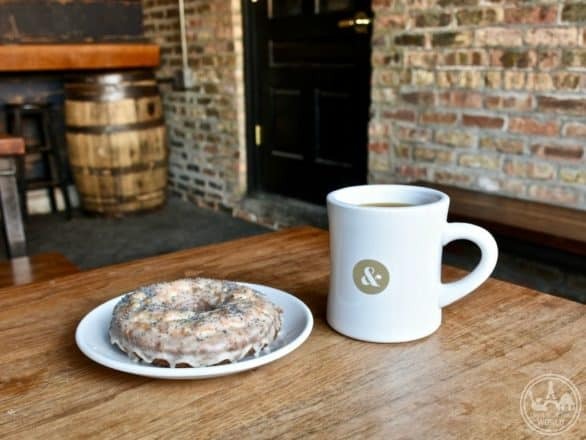 While sipping on locally-roasted coffee at Brewpoint in Elmhurst, Ill., you might nibble on a delicious donut from their case. That donut is from a local donut shop in Schaumburg, Ill., called Donut Drop. What pairs better than a locally-roasted coffee and a donut from a local shop? Donut Drop has a mix of both familiar and intriguing flavors. If you are looking for a chocolate cake donut, this is your place. If you are looking for something different like salted caramel, lemon, maple bacon, red velvet or other interesting flavors, Donut Drop is your place! Melissa from A Little Time and a Keyboard loves Donut Drop’s flare including interesting seasonal donuts like Peppermint Bark. Donut Drop is a fun community spot with fresh and yummy donut treats! Plus, they have Brewpoint coffee – local through and through! For more information, visit donutdrop.com. Where: Lebanon and Westfield, Ind. Titus Bakery originated in Lebanon, Ind., in the 1950s as a family-run business. Today with a second location in Westfield, Ind., Titus Bakery is still family-owned, and still baking donuts using some of the same delicious recipes. Pam at Be Happy, Be Healthy Wellness visited the Westfield bakery and recommends it. 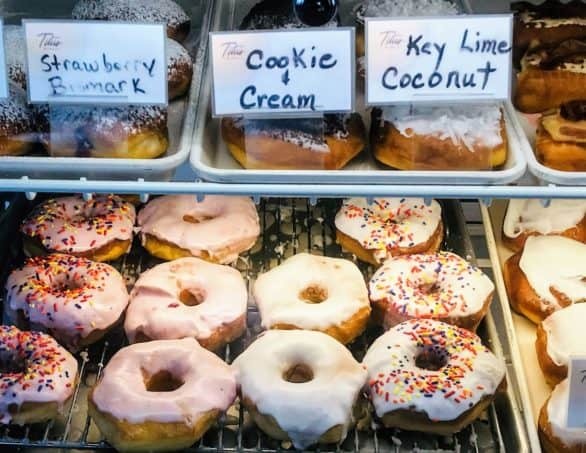 In addition to traditional yeast and cake donuts, Titus offers a variety of interesting flavors such as Key-Lime Pie, Cookies & Cream and Peanut Butter Fluff. Since Titus is a full bakery, you’ll also find delicious cakes, pastries and even sandwiches using Boar’s Head Meats. The Westfield location offers a party room perfect for a unique kids party with a decorate-your-own-doughnuts theme. For more information about Titus Bakery, visit titusbakery.com. 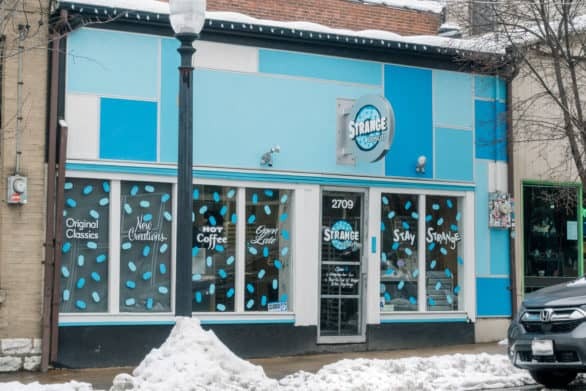 Jitters coffee shop in downtown Sioux City, Iowa makes the best cake donuts, according to Siouxland Families Blog, and for a very reasonable price. While they have espresso-based drinks, chai tea, Italian soda, wraps, sandwiches and more, but the real star is their donuts. They have chocolate, maple, and vanilla frosting with sprinkles, coconut, or peanuts everyday, and on weekends, go gourmet with toppings to rival any you’ve seen on Pinterest. A favorite is chocolate frosting with peanuts. Jitters is within easy walking distance of many of Sioux City’s downtown attractions, which makes it a great place to meet with friends or stop at on the way to a museum, movie, or downtown store or event. For more information, visit Jitters’ Facebook page. When a local bakery that dated back to 1896 was in danger of closing, the local police department came to the rescue. All nine members of the Clare, Michigan PD joined together and purchased the bakery, which was renamed Cops & Doughnuts. 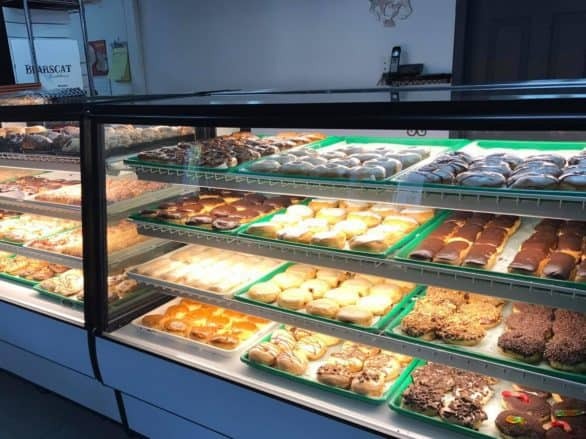 They’ve since saved similar bakeries in other small Michigan towns, like the one in Ludington where you can grab a cup of coffee with a galaxy donut, an over-sized donut hole, or a scrumptious apple fritter. The Ludington location originated as McDonald’s Bakery back in 1898. There are now several locations in the state. Visit copsdoughnuts.com for more information. World’s Best Donuts, a small seasonal shop in Grand Marais, Minn., specializes in cake donuts: Lighter in texture than a traditional cake donut, they’re best when coated with a thick dusting of cinnamon sugar. Other selections include raised donuts, twists, cream or jam-filled bismarks, long johns, apple and blueberry turnovers, jam-filled croissants, caramel pull-aparts, and cream cheese and maple swirls. Another must-try is the skizzle, a flat piece of fried dough coated with sugar—similar to a thin version of American Indian fry bread. 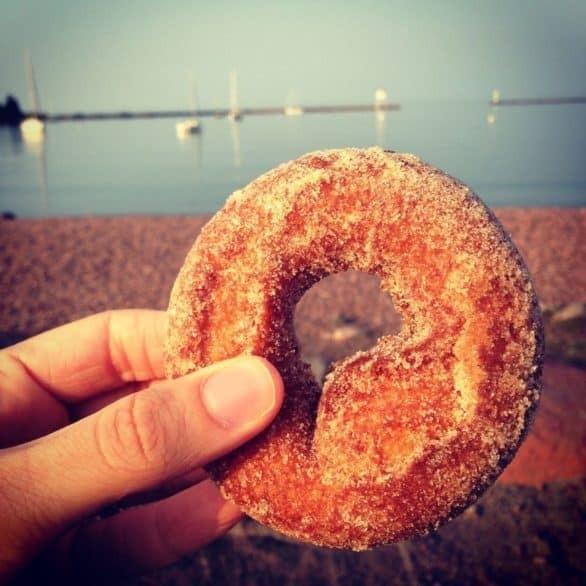 There’s a café-style seating area inside, outdoor picnic tables, or you can enjoy your donuts on a nearby harbor side bench overlooking Lake Superior. Visit worldsbestdonutsmn.com for more information. Glam Doll Donuts is one of the most famous donut spots in Minneapolis – for good reason. From the classic Vanilla Darling (featuring vanilla icing and sprinkles), to the mouthwatering Bellybomb mac & cheese donut (for the savory donut lovers), and even vegan donuts, Glam Doll Donuts never fails to electrify visitors’ taste buds. All doughs, fillings, and icings are made from scratch. 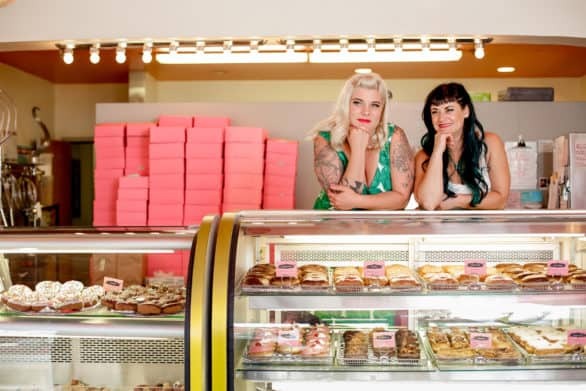 Glam Doll opened its first location in 2013 on appropriately named “Eat Street” in Minneapolis; and now you can get your sugar fix in Northeast, as well, and even pair your donuts with a beer. This isn’t your typical donut shop – the Glam Dolls created a pink fantasyland filled with award-winning donuts, rotating art gallery, a photobooth, and much more. For more information, visit glamdolldonuts.com. 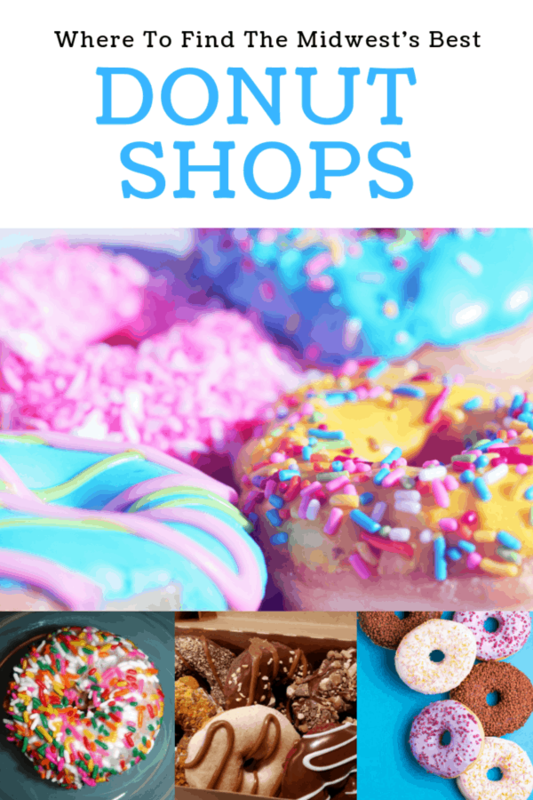 Hurts Donut Company has many locations now but its flagship store is in Springfield, Mo. The company has been making these crazy creations since 1999 and now have more than 70 kinds. From cereal-themed like Fred Flintstone to candy-themed like Reese’s and Twix, there are so many options it’ll make your head spin. Then there are the hands-down guaranteed flavors like S’mores, Nutella, Oreo Cheesecake, Maple Bacon, and Apple Pie. And don’t forget the shakes where they grind up a donut with ice cream then plant a whole one on top around your straw! For more information, visit wannahurts.com. The name tells you exactly what to expect from this St. Louis donut shop. Strange Donuts serves up a weekly donut called “The Stranger” that is more of a gourmet pastry than your typical donut. Past ingredients have included: Lemon curd, raspberry ganache, ice cream, fried chicken, Gruyere cheese, and cookie dough. The list could go on forever. 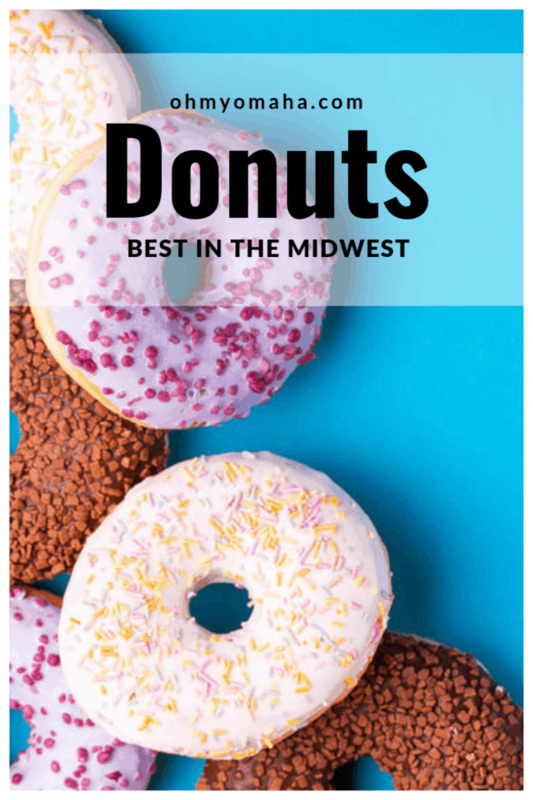 Most of the time, these ingredients are locally-sourced from other restaurants around town, making these donuts something for St. Louis to be proud of, according to Kelly at Greetings From Kelly. 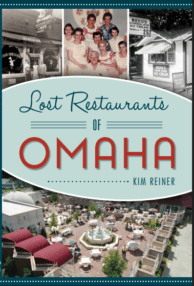 I’ve tried many donuts around Omaha (seriously. 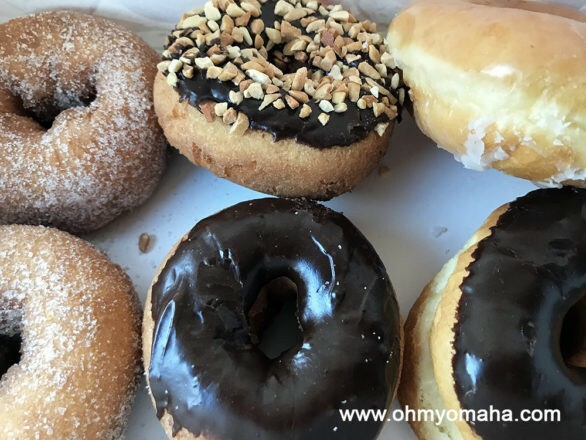 Here’s my Best Donuts In Omaha post to prove it), and while some have some pretty offerings and unique flavors, nothing can compare with the downtown hole-in-the-wall, Olsen Bake Shop. And I say “hole-in-the-wall” with affection here. It’s just tiny, so don’t expect to sit anywhere to enjoy your donuts. 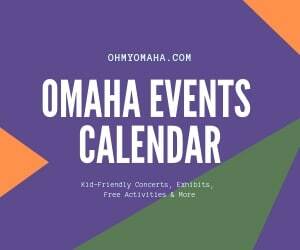 Olsen Bake Shop is a small donut shop that makes fresh and delicious donuts in downtown Omaha. Olsen makes classic donuts with pretty standard flavors, and they do them well. Go with any cake donut and you’ll be happy. For more information about Olsen Bake Shop, visit their Facebook page. Who doesn’t love donuts? 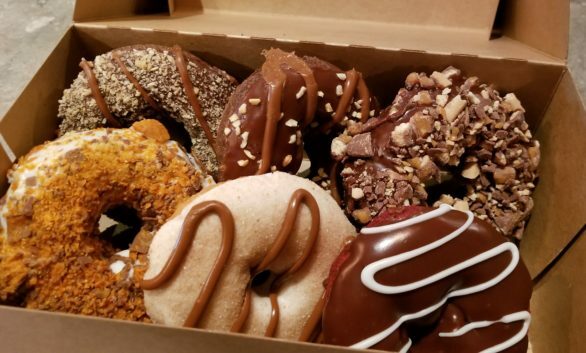 Don’t miss your chance to try some of the delicious flavors at Bearscat Bakehouse in Bismarck, N.D. Bearscat is actually a reference to an old cowboy term for donuts. The owners thought it was silly and decided to name their donut shop Bearscat Bakehouse. They have kept up having fun and being silly since 2011. While they do have traditional donuts , some of their flavors are really unique: Like The Elvis (banana-filled, peanut butter icing, bacon added and chocolate drizzle) or The Kramer (chocolate icing, with pretzels and caramel drizzle). They really do have donuts you will not find anywhere else. There aren’t many donut shops in Bismarck, but they would have some tough competition if there were. This place is delicious. 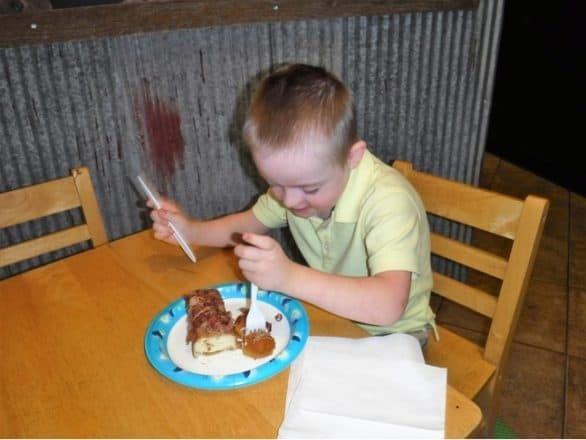 “Our youngest son chose the cinnamon roll and it was bigger than his head (he ate all of it, but did share a few bites),” said Chris, from State By State Adventure. “Their signature donut is called Bearscat, which is a strange name for a delicious baked good. It is a glazed dark chocolate cake donut and could be the best doughnut we have ever eaten! For more information, visit bearscatbakehouse.com. Located in Cleveland’s artsy Gordon Square neighborhood, Brewnuts melds two things that Clevelanders love: donuts and craft beer. The donut bar was begun by two locals who wanted to mix Cleveland’s burgeoning brewery scene with delicious donuts. And they did this by not only opening up a bar that stocks both local beers and handmade donuts, but they make the donuts with the beer. At Brewnuts, the donut menu rotates with the seasons (usually based on which beers are available). 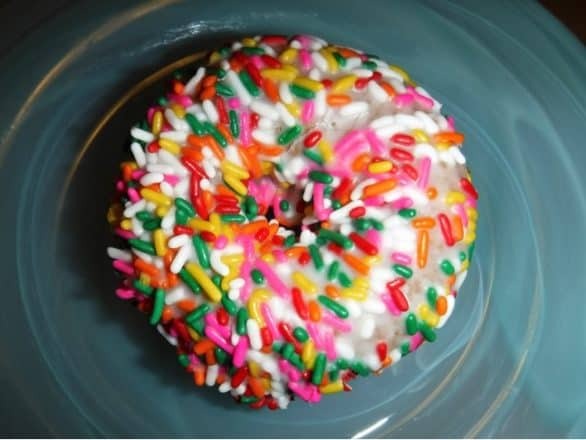 You’ll find filled donuts, cereal-topped donuts, and decorated donuts, all of which are sure to please the taste buds. Eat your donut at the bar, and you can pair it with a recommended beer. 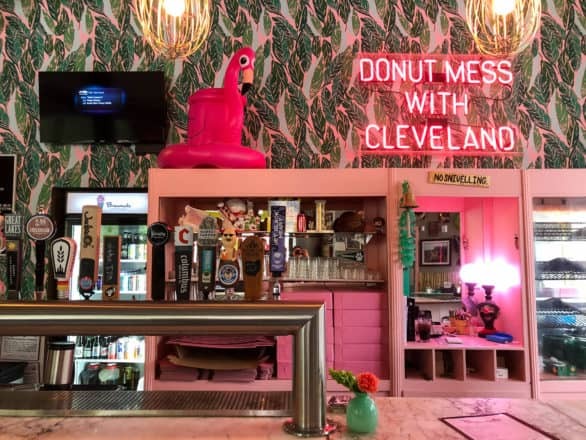 And, of course, Brewnuts is totally Instagrammable, too – both the bar AND the donuts will look great on your social media feeds, according to Cleveland Traveler. For more information, visit brewnutscleveland.com. 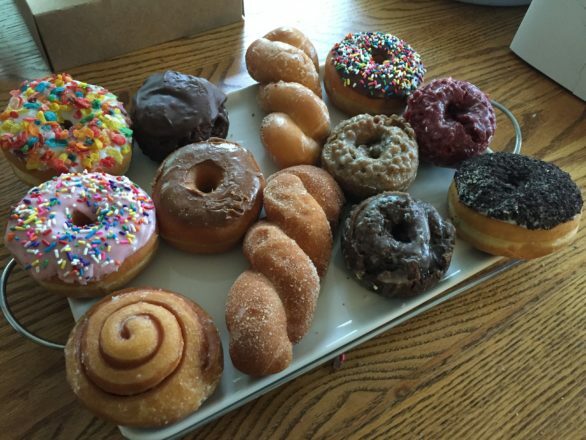 Flyboy Donuts is Sioux Falls’ gourmet donut stop, with a huge variety of donut flavors, shapes, and types. One of the most unique things they offer is donuts shaped like any letter of the alphabet, so people can custom order the letters of someone’s name or a special message as a gift or party decoration! A favorite of the Siouxland Family Blog is the Jet Fuel Joenut, which is a mocha donut topped with chocolate frosting, whipped cream, caramel drizzle, and chocolate-covered espresso beans. Flyboy has two locations, which means wherever else you’re headed in Sioux Falls, one of them will probably be near your path. For more information, visit flyboydonuts.com. I’ve never had a donut there (but that’s just because I can never get past the breakfast pizza). I did not need to read this while hungry… welp, need to run to Brew Nuts now! I cannot even begin to tell you the number of times I was tempted to take a snack break while compiling this post!